The Story of Qiu Ju (Chinese: 秋菊打官司; pinyin: Qiū Jú Dǎ Guānsi; literally: 'Qiu Ju goes to court') is a 1992 Chinese comedy-drama film. The film was directed by Zhang Yimou and, as in many of his films, stars Gong Li in the title role. The screenplay is an adaption of Chen Yuanbin's novella The Wan Family's Lawsuit. The film tells the story of a peasant woman, Qiu Ju, who lives in a rural area of China. 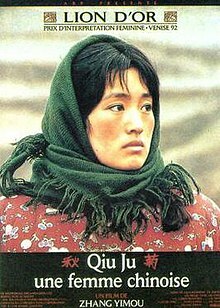 When her husband is kicked in the groin by the village head, Qiu Ju, despite her pregnancy, travels to a nearby town, and later a big city to deal with its bureaucrats and find justice. The film was selected as the Chinese entry for the Best Foreign Language Film at the 65th Academy Awards, but was not accepted as a nominee. The film was a hit at film festivals and won the Golden Lion award at the Venice Film Festival in 1992. Qiu Ju is a peasant who lives in a small farming enclave with her husband Qinglai. She is in the final trimester of her pregnancy. One day while her husband is conversing to Wang Shantang, the head of the community, a miscommunication ensues. The leader feels insulted and beats Qinglai, kicking him so severely in the groin that he must see a doctor and remain absent from work. Qiu Ju goes to the local police office and complains. The policeman makes the village chief pay 200 yuan to Qinglai. When Qiu Ju goes to the headman, he insultingly throws the 200 yuan notes onto the ground and refuses to apologize. Qiu Ju then goes to the provincial capital accompanied by her husbands' younger sister, Meizi. By luck the two women find lodging at a cheap hotel. The two women meet the district police chief and he promises them that their case will be reviewed. The new verdict from the district police is that this time the village headman must pay 250 yuan. He still refuses to apologize and so Qiu Ju goes back to the big city and finds a lawyer who takes the case and files suit under a new law. The case is judged by the court as having been correctly resolved by the district, the fine remains at 250 yuan, Qiu Ju is unhappy but all she can do is make yet another appeal to an even higher level of police investigation. As part of the suit, officials come to the village and Qiu Ju's husband is X-rayed at the local hospital. It's now the middle of winter, Qiu Ju goes into labor. When sought help, the headman with a group of local men carries Qiu Ju to the hospital, where she gives birth safely to a healthy baby boy. A month later the whole village is invited to the "one-month party" for the baby. Qiu Ju and her husband invite the village chief too for his help in saving Qiu Ju's life. But he doesn't come, and the local policeman shows up to tell Qiu Ju that the X-rays revealed her husband had a broken rib. As a result, the village chief is being sent to jail on a fifteen-day-term. Qiu Ju tries to stop the police from taking the headman away but never even sees the police and the movie ends with Qiu Ju looking anguished. This ending, along with some selfish and anti-community behavior on the part of Qiu Ju and her husband expresses the difficulty of regarding the film as a simple fight against injustice. Rather, it shows the limitations of modern legal approaches in villages where old-style human relations underlie social life. The film was set in present-day China (1992) in northwest Shaanxi province (an area which the director would return to in his film The Road Home). Many of the street scenes in the cities were filmed with a hidden camera so the images are a sort of documentary of China during the time of Deng Xiaoping. As film critic Roger Ebert said "along the way we absorb more information about the lives of ordinary people in everyday China than in any other film I've seen." The Story of Qiu Ju has been released several times on DVD. In the United States, the first release on Region 1 DVD was by Columbia/TriStar Studio on July 20, 2000. More recently, the film was re-released by Sony Pictures Classics as part of their Zhang Yimou collection (which also included new versions of Ju Dou and Raise the Red Lantern) on March 28, 2006. Both versions include subtitles in English. An older VHS cassette version of the film was also released in the United States by Sony Pictures on January 17, 1995. ^ "Foreign Oscar entries submitted". Variety. Retrieved 20 September 2015. ^ "The Story of Qiu Ju". Cineplex. Retrieved 2017-06-26. ^ Larson, Wendy (2017). Zhang Yimou: Globalization and the Subject of Culture. Amherst, MA: Cambria Press. pp. 133–166. ISBN 9781604979756. ^ Roger Eberts (May 28, 1993). "The Story of Qiu Ju". Chicago Sun Times. ^ "The Best 1,000 Movies Ever Made". The New York Times. Retrieved 14 March 2016. This page was last edited on 17 January 2019, at 11:04 (UTC).